Click on the title below to see further details of the lectures during the 2017-18 winter season. Tuesday, 17th October 2017 "Recreating ancient pots"
Tuesday, 21st November 2017 "Death (and life) at RAF Lakenheath: the Anglo-Saxon story"
In 1997 archaeologists excavating at RAF Lakenheath ahead of the construction of a new dormitory found a man buried with his weaponry and a horse. Jo Caruth was part of that original team and has spent the last twenty years researching the Anglo-Saxons at RAF Lakenheath. At this lecture she will reveal what we have learnt about Anglo-Saxon life from that work. Tuesday, 19th December 2017 "The Mesolithic site of Star Carr, North Yorkshire"
This lecture explores the use of new technologies to try to uncover an old story. 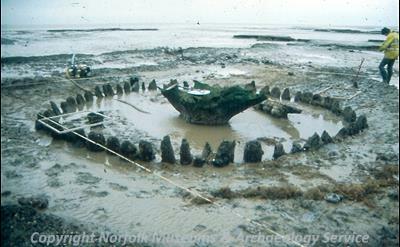 Tuesday, 16th January 2018 "The Sister of Seahenge"
Norfolk Historic Environment Service, Dereham. Tuesday, 20th February 2018 "The Upper Palaeolithic and Mesolithic of West Norfolk in context"
The talk places the record of LUP and Mesolithic activity in West Norfolk into its wider context within East Anglia, based on recent research which has reviewed the lithic scatter record from Norfolk and adjacent counties. This evidence is, in turn, related to what is known of the chronology and character of the LUP and Mesolithic more generally in southern Britain and in adjacent parts of the continent. It will be shown that, despite having been somewhat neglected, the record of West Norfolk offers a important window into the lifeways and activities of LUP and Mesolithic societies, from rare evidence for the first communities who reoccupied Southern Britain at the beginning of the Late Glacial Interstadial to the last hunter-gatherers occupying the landscapes of East Anglia prior to the uptake of agriculture. Tuesday, 20th March 2018 "From Wash to Sherwood Forest: some key themes in the life of an early medieval archaeologist"
17th April 2018 "Northern Journeys: Medieval Anglo-Norwegian Trade, in Good Times and Bad"
The University of Cambridge, Cambridge.